Following up on yesterday’s post about the book Heat, which I finished last night. The author, Bill Buford, is summing up his experience in Italy, and he talks about food there and as it is done modern day. My theory is one of smallness. Smallness is now my measure: a variation on all the phrases I’d been hearing, like the Maestro’s “it’s not in the breed but the breeding” or Enrico’s “less is more.” As theories go, mine is pretty crude. Small food – good. Big food – bad. For me the language we use to talk about modern food isn’t quite accurate or at least doesn’t account for how this Italian valley has taught me to think. The metaphor is usually one of speed: fast food has ruined our culture; slow food will save it. You see the metaphor’s appeal. But it obscures a fundamental problem, which has little to do with speed and everything to do with size. Fast food did not ruin our culture. The problem was already in place, systemic in fact, and began the moment food was treated like an inanimate object – like any other commodity – that could be manufactured in increasing numbers to satisfy a market. In effect, the two essential players in the food chain, (those who make the food and those who buy it) swapped roles. One moment the producer (the guy who knew his cows or the woman who prepared culatello only in January) determined what was available and how it was made. The next moment it was the consumer. What happened in the food business has occurred in every aspect of modern life and the change has produced many benefits. I like island holidays and flat-screen televisions and have no argument with global market economics, except in this respect – in what it has done to food. The watery eggs Gianni bought when he fell asleep after lunch: big food. Granny’s eggs sold under the counter to Panzano regulars: small food. Th pig I brought home on my scooter: Small food. A ham from a chemically treated animal that has spent its life indoors in a scientifically controlled no-movement pen (every cut perfectly identical as though made by a machine): big food. The Italians have a word, casalinga, homemade, although its primary sense is “made by hand.” Just about every preparation I learned in Italy was handmade and involved my learning how to use my own hands differently. My hands were trained to roll out dough, to use a knife to break down a thing to make sausage or lardo or po;pettone. With some techniques, I had to make my hands small. With others, I made them big. 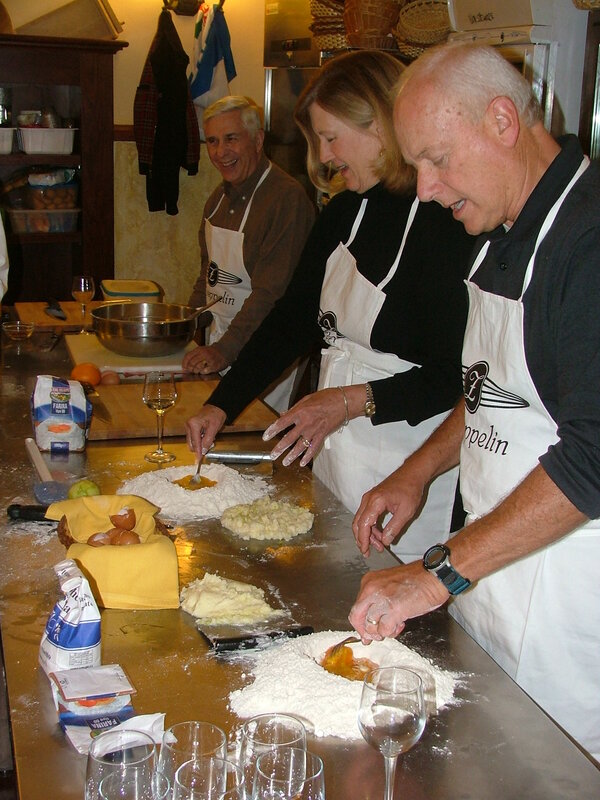 With hands, cooks express themselves like artists. And perhaps that is the difference: food made with your own hands, reflecting care and investment and love. It is unrealistic to think we will go back or that we can feed the numbers we have to feed otherwise. But we can at least make conscious choices. We can shop local, support local farmers, buy in season. Thankfully, this seems to be happening. Buon appetito!